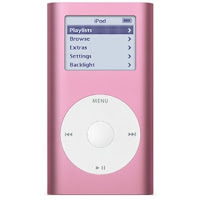 The battery of my pink 4GB iPod mini died on me. It would not charge anymore. Sigh… It would play music when it’s sitting in its dock. I can no longer update it as it would not turn on. Its battery had been the known problem of an iPod mini. Well, my good ol’ Mini is close to four years old. I purchased it November 2004 for Php 15,000! iPods cost that much several years ago. I was surprised (and secretly pleased) to learn prices have gone down since I bought my Mini. I thought long and hard whether I will need a new one. My best friend Cheryl convinced me that I need an MP3 player for the gym so people would not talk to me or when I need to listen to Joel Osteen’s podcasts while on travel. Now those are very valid reasons. I set aside money from my SSS loan in case I do end up wanting one. Due to an unexpected development last Friday, and my EQ was low; I set off to buy a replacement for my iPod mini. I originally was intending to buy a Nano but with a bigger memory of 8GB. 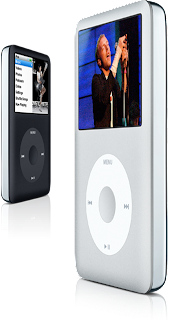 And then my husband intervened and encouraged me to buy the next one on the hierarchy list of iPod -- the iPod Classic with 80GB memory. It could be bribery.. I dared not argue with him. I immediately walked to the nearest PowerMac Center and purchased a silver iPod Classic. When I reached home, I plugged it in to our laptop and it transferred all 600+ songs and my saved Joel Osteen podcasts from my iTunes. Not only songs and podcasts, it also synced photos from My Pictures. I was pleased to see 800 plus of our wedding photos transferred automatically! Now, it is easier to share photos with others. There is no need to bring a bulky laptop. A new feature I explored is Videos. I had no idea that the new iPod Classic replaced the iPod Video until my brother pointed it out to me. I was even more delighted with my new toy. Since I do not have any file of any movie or TV show, I immediately loaded our on site wedding AVP. Even if I have seen that so many times, I watched it over and over again. Somehow it looked better on the small screen of the iPod. I am in the process of downloading season 4 of Grey's Anatomy which is a test of my patience as it is taking a LONG time. Oh I will reap the fruits of my labor soon. Jed was as pleased as I. He even tried it before I did. I did not mind at all. I'm happy I listened to him and I am enjoying this iPod because of him.